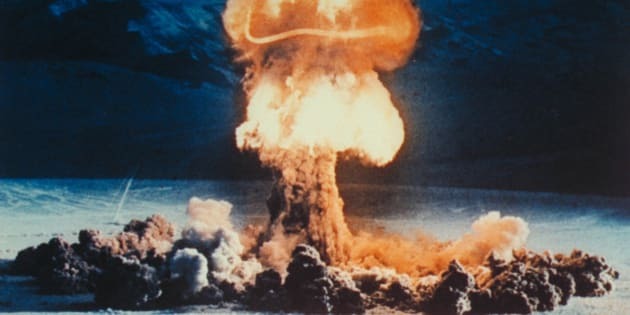 The United Nations has declared August 29 the International Day Against Nuclear Tests, "a day in which educational events, activities and messages aim to capture the world's attention and underscore the need for a unified attempt in preventing further nuclear weapons testing." Anyone who ever had to do hide-under-your-desk disaster drills in grade school knows the spectre of nuclear disaster looming over people's heads is no joke. This fear of a nuclear apocalypse caused by politicians and war mongers was especially strong during the Cold War posturing that took place in the '60, '70s and '80s. Musicians, naturally, channelled these anxieties into pointed, chilling and often awesome protest songs. So to mark the International Day Against Nuclear Tests we collected some of the best songs from that period. Click the slideshow below to hear these songs and remember how you once assumed the world would be an irradiated wasteland by 2013.